VMI’s Cantilever batch-off or strip cooler design is the base of various machine combinations for rubber strips or slabs up to 500 mm width. At the heart of this system are the dipping section and an electrically driven cooling rack with its bars attached to one side only and going round in one level. This makes the Cantilever machine compact and gives an easy overview. Cantilever lines are always customized to meet customers’ specific needs and applications. As batch-off it mainly finds its destination in low to medium capacity mixing lines in the technical rubber industry. For direct endless strip production this is the optimal choice. Combinations range from a basic system with a six-fan cooling rack and a one-strip stacker to a complete multifunctional high capacity batch-off system, capable of handling separate strips, slab, perforated slab and cut sheet. Strips can be supplied from an open mill or from an extruder in front of the dip tank. 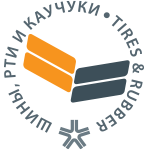 In combination with VMI stackers you will obtain perfect stacks and an optimized rubber strip or slab handling. The conveyor at the front of the machine receives hot rubber strips or slabs coming from an extruder or an open mill. The rubber passes sections where marking, splicing, strips separation or strip cutting can take place. Then the rubber is conveyed through an anti-tack liquid in the dipping section. The dipping section consists of a dip tank and a holding tank. Another holding tank can be placed in order to change the liquid very fast or for cleaning purposes. The dipping module is completely built up of stainless steel. Only special heat resistant modular plastic conveyor belts are used. After the dip section, the strips are discharged on the cantilevered carrier bars in the cooling rack. The cooling festoon rack is electrically driven and the stepping speed of the bars is automatically adjusted to the preset loop length. The stainless steel carrier bars are equipped with laser-cut teeth for a good grip on the rubber. Ventilators, from six up to more than fifty, mounted at one side of the cooling rack, will dry and cool the rubber. The ventilators can be switched on and off in groups so the airflow can be adapted to specific needs. 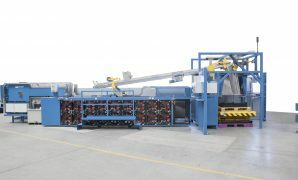 After the rubber is cooled, it is either automatically taken out of the cooling rack and transported to the stacking system, or the first ends are manually taken out. Combined with the High Performance (HP) Cutter Stacker, 800 mm to 1000 mm wide pallets can still be optimally filled with two stacks of narrow slab of cut sheets (plates).